We all have our “favourite authors”. You know the ones! They churn out awesome book after awesome book and after a while you get this suspicious feeling that they’re either a) not from our planet, b) unnaturally and wickedly talented, and c) conspiring to empty your wallet of money forever because YOU BASICALLY MUST OWN EVERYTHING THEY WRITE. Ah, well, you know my secret now. I really love Maggie Stiefvater’s books. My first read was The Scorpio Races. Oh, excuse me, I’m just drowning in fond memories and November cakes. See? That right there is proof of a good author! She includes food in her book and then brings them to life with recipes, so you can literally slot into The Scorpio Races yourself. Then leave again, because I’m just saying…it’s a dangerous world full of flesh-eating seahorses. Next I read Lament and Ballad. Lament is actually her first book! Bring on the faerie awesomeness…and death. Minor detail. While this series isn’t high on food, just like all things Maggie-Stiefvater, it’s highly original. (Except for the whole cliche love-triangle thing, but in her defence, she wrote this when love-triangles weren’t “the only way to have a romance”.) I’ve still never read any faeries who could live up to hers. Also: I do not ship Dee and James. I don’t care what anyone says. They are not right for each other. And I would like to point something out. I am absolutely sure the release date gets pushed back every. single. year. I want to know what happens! Can we please at least see a cover…or blurb. Anything? 1. Her characters are always funny. I love humour! It’s my favourite. How can her books always feature incredibly witty characters and STILL keep the characters all unique and different? My favourite is definitely James from Lament and Ballad. 2. She has huge character casts and they’re not confusing. I’m looking specifically at The Raven Boys here. Until I read those 409 pages of awesome, I had never ever read a book that featured 4 boys who had unique and different personalities. I get it! It’s HARD to write characters who don’t meld together. So what wizardery is this?? As soon as I saw the names rattled off: Gansey, Ronan, Noah, and Adam and then add in all of Blue’s relatives…I was sure I was a goner. Absolutely not. They’re individuals. They’re exceptionally well written. 3. Also: Isabel Culpeper and Cole St. Clair. 4. She says great and wonderful things about books. This is the most frustrating of all, actually. Some people get to be a) funny, b) musically talented, c) great writers, or d) amazing artists. WHY SHOULD ONE PERSON GET TO BE ALL FOUR?? Now I’m about to go reserve Lament and Ballad from the library for a reread. I never reread books, peoples. This means something huge. 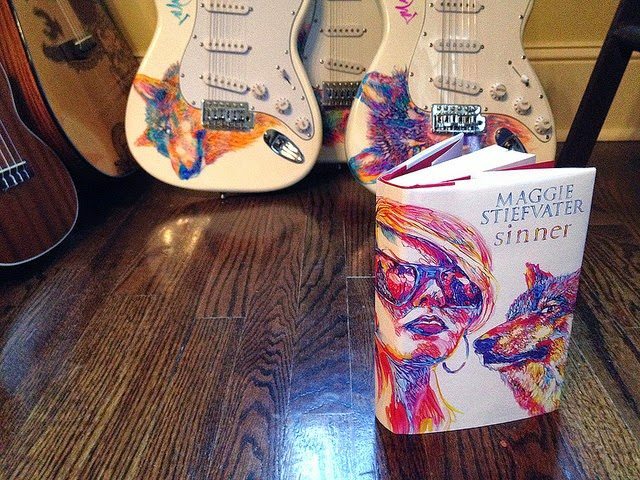 have you read any maggie stiefvater books? tempted to try one?! what’s your favourite? let us fangirl together. which are you most looking forward to: sinner, requiem or raven cycle #3? Cait has had a genius idea for a book…buuuuut. She’s in the midst of rewrites. She CANNOT stop rewrites to chase a random idea. No no no. (She’s saying this for her benefit mostly, but you get to be moral support.) Between the agony of this situation, she’s reading Harry Potter and the Goblet of Fire. Are the Weasley’s not the nicest family ever?! (Nooooo Cait, ignore the Shiny Idea Syndrome! IT IS A LIE!). Ahem. So I had to return The Raven Boys since I didn't have time to read it. But I should reborrow it again, yes? I like humour. And I can't ignore such a vehement recommendation. Especially because food. FOOD. (I must make November cakes). Okay, now I'm hungry. Good job, Cait. ALSO, YOU ARE READING HARRY POTTER. HUZZAH. (I'm concentrating very hard on ignoring. There's practically smoke coming out my ears. CONCENTRATING. )I kind of really very much hope you like Raven Boys. Eeep. Although I know you didn't really love Throne of Glass (aaand that's okay. I still like you XD) but Raven Boys DOES have a slow start. I'm just way too addicted now. x) I'm awesome at making people hungry, seriously. Try WRITING these posts. I'm starving. 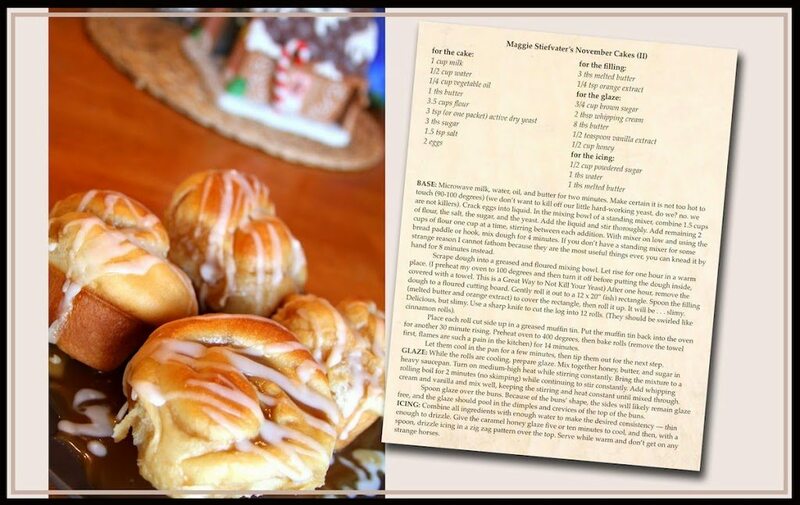 November cakes? Yes please.I just realised I'm OVER 10 years late to reading Harry Potter. OVER TEN YEARS. Woah…!! Maggie Stiefvater! (It's taken me a long time to learn how to write that last name…) Just read The Raven Boys and I am so excited for book three. I tried Lament and Ballad, but silly me accidentally read them the wrong way round, even though I had both books, and I didn't like Dee very much, so I never finished the first book (though I read the second one). Loved James though, so much. He is my new favourite character. I had to actually physically TEACH myself to write her last name right! That's dedication, yup. x) Although sometimes I still mess up the e and i at the beginning. *ahem* The Raven Boys…. *swoons* I'm so so so keen for book #3. Nearly as much as Sinner. Dee I don't love either. I felt very cross at her during Ballad, because I DO ship Nullah and James. Although, yeah, Nullah had an awkward twist there with the whole dying thing. But whatever. These things can be fixed. James is AMAZING. O I read the Wolves of Mercy Falls and can't wait to read more, Yes you Sinner hurry up and get in my hands. I will wait for the other series to be finished first so I am not left waiting years like you have. I don't know how you guys do it, to be honest.it is unfair that she gets all four, but at least she shares them with us. Eeee, Sinner! XD I keep seeing the cover-doodled-illustrated ones and being SO sad they're only for USA. I covet one very very badly. Agh, I don't know how I've survived waiting this long for Requiem. Ever year it gets pushed back and I cry a little harder. I've only ever read The Wolves of Mercy Falls but that was like way way back when it was super popular and I was just starting puberty. Back then, you could've thrown me anything mainstream and I would've fangirled haha! I don't know if I would like it if I read it now though. However, I think I'd really like The Scorpio Races so I definitely want to read that. I AM MOST EXCITED FOR SINNER. I can't wait to get my hands on it. I hope I can read it when it comes out! I was tough on them when I first read them…like mostly 3-4 stars. BUT. I have super fond memories, and I couldn’t have laughed harder. Her characters are ALWAYS the best. x) The Scorpio Races is probably still my ultimate favourite…although, I won’t lie, I have a very big soft spot for The Raven Boys. She IS great! (It's hard to tell, but I totally recommend her books. x)Agh…all these wickedly talented people?!! YES TO MARISSA MEYER AS WELL. Ahhhhh. Too awesome. But yes, 6 years is way too long to wait and honestly, I'm losing faith that I'll ever find out what happens. But I want to knooooow. At least The Lunar Chronicles are all coming out EXACTLY one years apart. Four years I can handle, if I get various books whilst waiting. 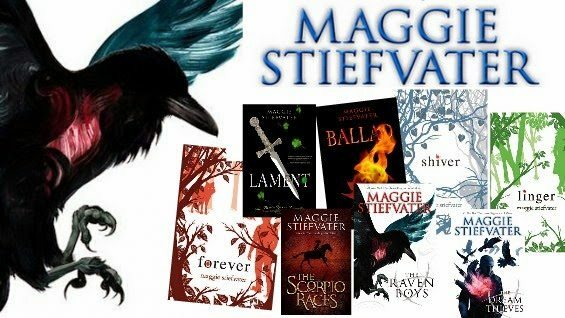 But to be fair, Maggie Stiefvater has come out with (nearly) 3 Raven Boy books in between, so I can't be too angry. I've only read Shiver, and I…….did not really care for it. One of those books that I enjoyed at the time, but the more I thought about it afterwards, the more problematic I found it. But maybe I should try The Raven Boys instead! I DNFed Shiver a while back (the plot was so good, but the characters…. GRR), but really want to check out The Raven Boys. I've heard so many good things about it. And tons of characters that aren't mixed up? (I'm looking at YOU, George R.R. Martin. Stop confusing me!) And then Lament after. Or maybe Lament first? I'll have to think about that a bit more. I do want to read Sinner, too. But no more Grace and Sam, please! Ha! Really?! I would've said opposite for Shiver! I loved the characters but the plot was pretty sloooow. LOL The Raven boys, yes yes yes. They are fantastic. But it's kind of slow in place, but after a while I just didn't care anymore. x) I'm eventually one day when I get the courage going to read Game of Thrones. But I'm so so so worried about how many characters there are. But they all die, right? So it shouldn't be too bad. I'm looking forward to Sinner and the third Blue Lily, Lily Blue….I'm ashamed to say I haven't read her fae ones or Scorpio Races – I guess I totally need to don't I!Wow she is an amazing artist!!! Omg, isn't Blue Lily Lily Blue's cover aaaamazing?! I can't stop looking at it. I haven't read any Maggie Stiefvater books! *hides* I guess I really must soon. The fact that she's got huge casts of characters yet still manages to make them all interesting and not utterly boring sounds really great. Which book of hers do you recommend I start with? WHAT. Go fix that!! x) Hehe, I'm just kidding…although I absolutely do recommend her. 😉 But you already know that. Oooh, it depends what kind of book you like the best, you know? Her's are all very paranormal/urban fantasy-ish. But The Raven Boys is psychics and ley lines. The Scorpio Races is horse (sort of) racing and epic islands. Shiver is werewolves. And Lament/Ballad are fey. Lament/Ballad are probably the funniest, if that helps. x) I LOVE FUNNY. I STILL NEED TO READ THE RAVEN BOYS! I have it in my bag but have not taken it out yet. Anyways, I've seen Shiver in bookstores, but the blurb didn't appeal to me for some reason, but then again I don't remember it! I should take it out of the library soon! I have the Shiver series on my Kindle but have not started on them yet and I'm also really interested with the Raven Boys series! I definitely need to get started though, I feel like I'm missing out by not reading this author yet! Go with Lament first, then. 😉 It'll get you laughing. But Ballad is narrated by James and it's THE BEST OF EVER. *happy squeeing* I aspire to be the sort of author Maggie Stiefvater is. I haven't actually read too many of her books, but I ADORE them. Which says a lot about her writing.Also, I'm insanely jealous of her artistic talents! How can one person be good at so much?! *whispers* So do I. She's one of the top-authors of EVER that I just sigh and hope one day I can be half as awesome. x) I've nearly read all her books, well, that are out yet. Except her kiddie one. But SINNER, omg, I'm going to buy it, I am. Oh…no! Not really! Doesn't sound familiar, except, well CAIT sounds familiar but that's my name. Sooo…probably not? Shiver's cast is basically: Sam, Isabel, Grace, Cole, Beck…and others of course, but those'd be the main ones. WE SHARE YET ANOTHER OBSESSION. Seriously, Maggie Stiefvater is my all-time favourite author. The Raven Cycle books are the most crazy-good things I've ever read and I don't know how she does it but DUDE. The lass weaves magic with her words (literally, I suppose, in Raven Boys terms).I agree all of her ideas are so unique; especially The Scorpio Races. They're all so cleverly done and vividly detailed and each character feels like they could have their own book and it would be fascinating. WE HAVE MARVELLOUS TASTE OBVIOUSLY. She's my all-time-favourite author too (I KNOW IT'S HARD TO TELL). But I would pick up anything she wrote. Ever. Ohhh, more Ronan and more Gansey and more EVERYONE. I love Noah, too. x) Adam kind of ticks me off, but sometimes he means well. *sigh* I seriously can't wait until it's out. I love Maggie too, but Lament was the first book of hers that I read. And I'm most excited about Sinner . . . but that could be b/c I haven't read The Raven Boys yet! *runs and hides* I KNOW! But I didn't want to suffer the wait between books like I did with the Shiver books! I'm being worn down though . . . The Weasley's are definitely the nicest family ever! <3 I have had The Scorpio Races for years but still haven't got to it, something that this post makes me really want to hurry up and do. I also really want to read The Raven Boys because of how much everyone seems to love it. I am petrified I won't though, me and hyped books don't always get along too well. I will try my hardest to read at least one of her books by the end of the year. 6 years waiting? I am so impatient so that would probably kill me. I've read all the Maggie books, some three or four times, and I regret nothing. She's my favorite author, and I'll continue to throw money at her until she gives me every last book in her head. Also, I do not ship Dee and James either. Blech. Also, I love your love for Maggie. Let's sit and wait for Requiem together, okay?